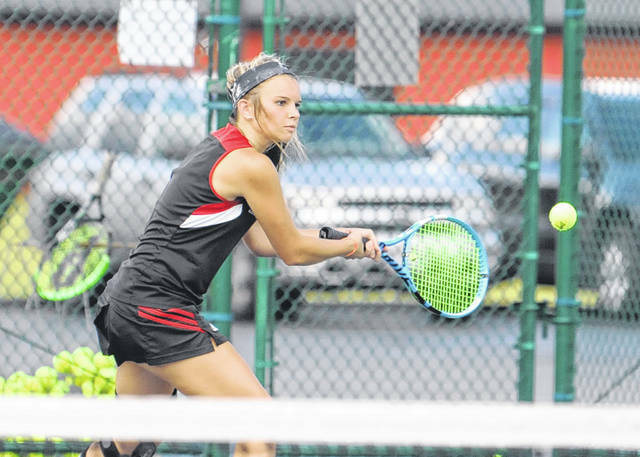 Alivia Reek has played a key role in the success of Preble Shawnee’s girls tennis team this fall. Shawnee is 5-1 in league play heading into the SWBL tournament this week. Allison Zornes has played well at No. 1 singles for Preble Shawnee this fall. She has helped the team to a 5-1 league record. 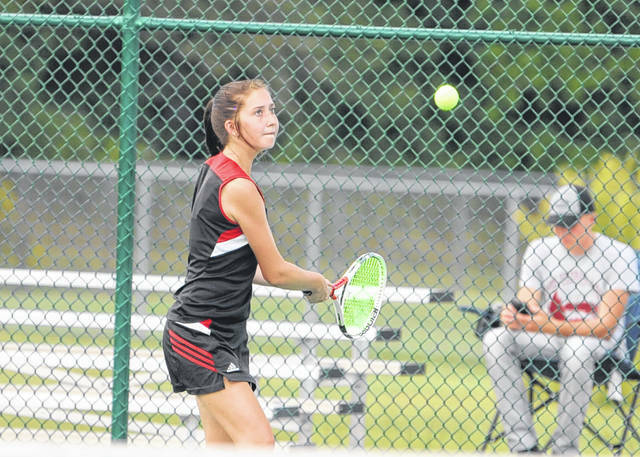 CENTERVILLE — Preble Shawnee’s girls tennis team finished second at the Centerville Doubles tournament on Saturday, Sept. 22. The duo of Allison Zornes and Alivia Reek finished as runners-up at 1st doubles with a 3-1 record beating Beavercreek, Miamisburg and Eaton. Their loss was to the champion doubles team from Centerville. Grace Deaton and Destiney Quillen were champions at 3rd doubles with a 4-0 record beating Centerville, Beavercreek, Miamisburg and Eaton. On Thursday, Sept. 20, Shawnee dropped a 3-2 decision to county rival Eaton. Shawnee is now 11-5 overall and 5-1 in the Southwestern Buckeye League Buckeye Division and holds a three-point lead (27-24) over Milton-Union heading into the league tournament this week. On Wednesday, the Arrows beat Trotwood Madison 5-0. “Our girls played very smart and efficient tennis tonight. They continue to remain sharp and very focused as we wind down our regular season schedule,” Hubbard said. On Tuesday, Shawnee defeated Carlisle 5-0. 2) Zoey Collins/Destiney (PS) def. Sarah Laughlin/Abby Goodpaster 6-0, 6-0. The Arrows began the week with a 5-0 win over Lebanon. 2) Zoey Collins/Destiney Quillen (PS) def. Meredith Chin/Katie Manwaring 6-7(1), 6-3, (11-9). The Arrows were scheduled to compete in the SWBL tournament on Tuesday, Sept. 25. They will begin sectional play next week. 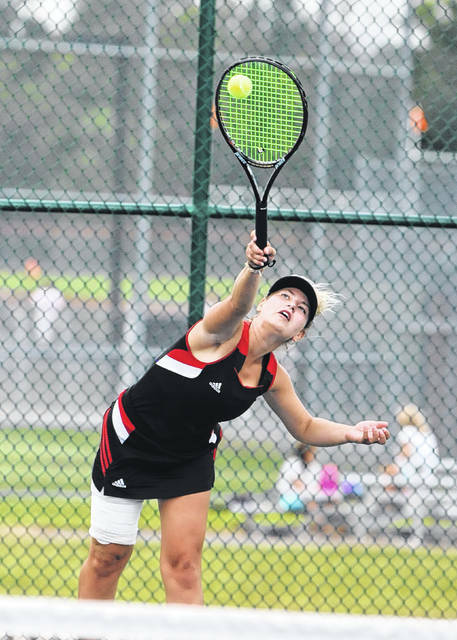 https://www.registerherald.com/wp-content/uploads/sites/41/2018/09/web1_ps_gtn1.jpgAlivia Reek has played a key role in the success of Preble Shawnee’s girls tennis team this fall. Shawnee is 5-1 in league play heading into the SWBL tournament this week. https://www.registerherald.com/wp-content/uploads/sites/41/2018/09/web1_ps_gtn3.jpgAllison Zornes has played well at No. 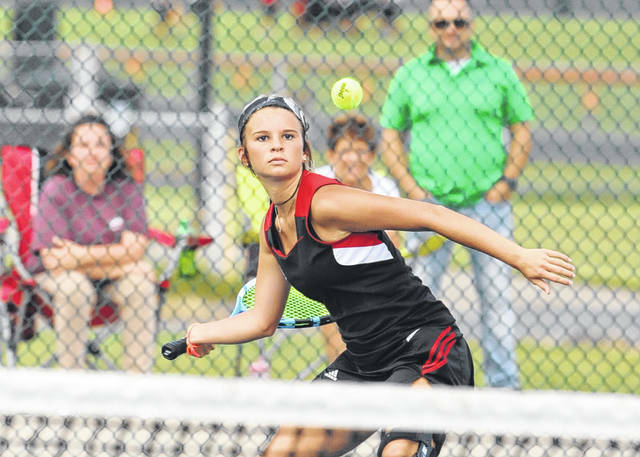 1 singles for Preble Shawnee this fall. She has helped the team to a 5-1 league record.